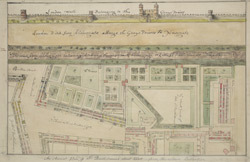 This is an 18th-century copy of Ralph Treswell's 1610 plan of the property of St Bartholomew's Hospital. Although better known as a painter in his lifetime, Ralph Treswell was also a mapmaker and one of the first land surveyors of the modern era. The plan shows London's Roman wall at the top, the ditch along Grey Friars leading from Aldersgate to Newgate, the chapel and churchyard of Little St Bartholomew, and the private tenements along Britten Street.